Welcome to the “Dog Days of Summer!” We continue the pace of activity leading up to the 3rd Annual Teal Steps Walk, September 23, 2018 at Tidelands Park, Coronado. Have you registered yourself and/your team yet? If not, click here for more details and registration. If you either subscribe to, or can view NETFLIX, there is an amazing documentary called “The Bleeding Edge” which confirms the importance of advocacy at NCI, FDA and organizations to ensure the patient community’s voice and presence is considered and heard. Also the grassroots movement of women (yet again!) in the country to protect women. This is an eye-opening look at the fast-growing medical device industry revealing how the rush to innovate can lead to devastating consequences for patients. I highly recommend watching it. Triage Cancer invited Peg Ford to write for their Blog (Ranked #6 Cancer Blog by Feedspot). 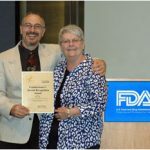 Her Blog: “How Patients Can Advocate for Evidence-based Research” was posted on July 17, 2018. The blog has been posted on our website and may be viewed by clicking here. The Community Advisory Board of Sanford Burnham Prebys Medical Institute Cancer Center, of which Peg Ford is a member, hosted the Cancer Center Open House Seeing is Believing: Cancer Imaging on June 14, 2018 with a nice turnout of some of our members. Click here to see a summary with pictures of the event. 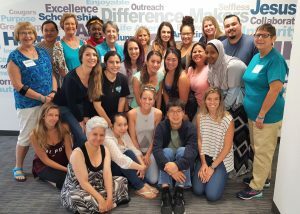 Another STS® presentation to Azusa Pacific University nursing students on July 12, 2018. Facilitator Barbara Horton reports, “A great class, so interested and attentive. Questions about risk factors, heredity, hormone replacement.” Photo below is of team members of Sue Sutton, Cheryl Price and Sherry Gobble and Facilitator Barbara Horton. A special HEARTM community outreach presentation to Our Lady of Peace Academy for High School Girls on July 26, 2018……..their Summer Health Class! Facilitator Cindy Silver reports, “We met their instructor Krystine and 14 wonderful girls…they were so attentive…taking notes….and at the end Krystine had some great questions for us! One of the girls asked what BRCA meant….and fellow presenter Sheryl Gobble gave a super definition educating all of us! Photo below is of Cindy and Sheryl surrounded with the class and their instructor. 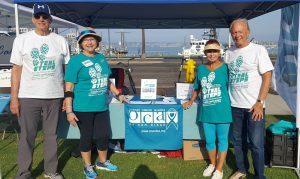 Ambassadors Barbara and Bill Horton and Naomi and Peter Edelmuth (photo) hosted our exhibit booth at Live Well San Diego (LWSD) 5K Walk on Sunday, July 29, 2018 to provide information on gynecologic cancer awareness by handing out our materials and information on our upcoming Teal Steps Walk 2018 on September 23, 2018 at Tidelands Park, Coronado!!! Click on each of the years below to view OCAofSD events from that specific year. Click on each of the years below to see pictures from that specific year.